Traveling on two wheels is one of our favorite ways to explore urban locales, but actually learning how to ride a bike in the city can be a challenge since there is a lack of wide open spaces for practicing. The Seattle-based Cascade Bicycle Club recently opened a “traffic garden” to help novice bikers learn the ropes and get more comfortable with safe cycling etiquette at crosswalks, turn lanes, and other city biking situations. The White Center Bike Playground, located on what was two mostly unused tennis courts, is one of only a few U.S. bike playgrounds, although they are popular in Europe. Kids and adults can safely practice maneuvering real-life biking situations in an enclosed area that is devoid of any cars. The design is the creation of an urban planner who saw the traffic gardens while in Europe and suggested the idea to the Cascade Bicycle Club. After making a smaller version outside Cascade’s headquarters, the bike club, aided by private donations and a large grant from the local parks division, built this new-and-improved traffic garden. The bike playground is open to the public and will also be used in several Cascade Bicycle Club educational programs, including a year-round youth development program that teaches young people from diverse communities about cycling. In addition to the clearly marked lanes, roundabouts, and crosswalks, the playground’s design also includes a storage area for bikes and a cement area with tables for relaxing and refueling after a busy biking session. The bike club and its designers hopes that the new space will become a gathering ground for the community as well as a fun and educational cycling space for breeding the next generation of two-wheeling enthusiasts. Traveling on two wheels is one of our favorite ways to explore urban locales, but actually learning how to ride a bike in the city can be a challenge since there is a lack of wide open spaces for practicing. The Seattle-based Cascade Bicycle Club recently opened a "traffic garden" to help novice bikers learn the ropes and get more comfortable with safe cycling etiquette at crosswalks, turn lanes, and other city biking situations. The White Center Bike Playground, located on what was two mostly unused tennis courts, is one of only a few U.S. bike playgrounds, although they are popular in Europe. Kids and adults can safely practice maneuvering real-life biking situations�in an enclosed area that is devoid of any cars. The design is the creation of an urban planner who saw the traffic gardens while in Europe and suggested the idea to the Cascade Bicycle Club. After making a smaller version outside Cascade's headquarters, the bike club, aided by private donations and a large grant from the local parks division, built this new-and-improved traffic garden. The bike playground is open to the public and will also be used in several Cascade Bicycle Club educational programs, including a year-round youth development program that teaches young people from diverse communities about cycling. 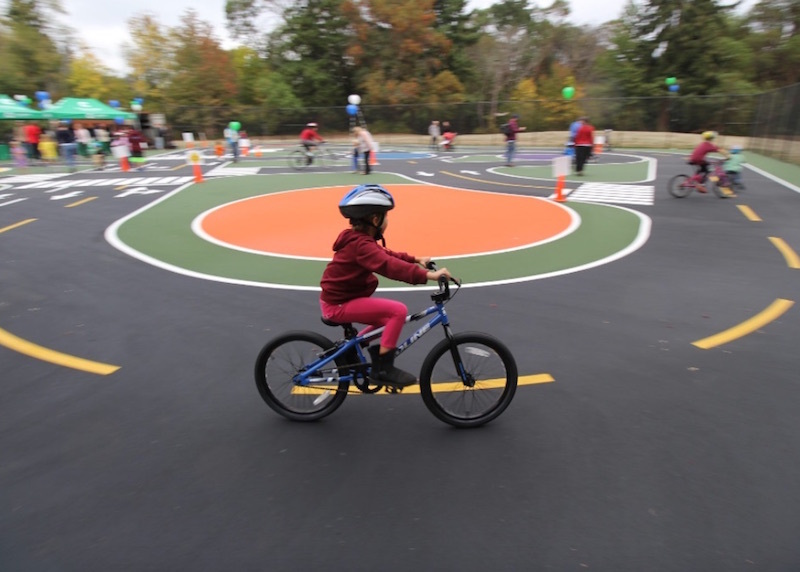 In addition to the clearly marked lanes, roundabouts, and crosswalks, the playground's design also includes a storage area for bikes and a cement area with tables for relaxing and refueling after a busy biking session. The bike club and its designers hopes that the new space will become a gathering ground for the community as well as a fun and educational cycling space for breeding the next generation of two-wheeling enthusiasts.